Masters of camouflage, able to change the color of their skin to deceive predators, chameleons are one of nature’s evolution exemplars. This has made them extremely popular in the pet reptile trade. Amateur and expert herpetologists are fascinated by the behavior and physiology of the chameleon. Knowing how to care for a chameleon is essential for a healthy pet – one who readily shows off all of his colors. Principal among these cares is choosing what to feed your chameleon. Chameleons are delicate creatures by reptile standards. They have specific temperature and humidity requirements. They need a certain amount of light each day, and they need to have darkness as well. They are easily stressed and require careful handling. They also require special nutrition. In captivity, it is difficult to simulate the wide range of insects and plant matter that the wild chameleon might have available to him, so proper balance and dietary supplementation when caring for a pet chameleon is important. There are very few types of bugs that chameleons won’t eat. That isn’t to say they should eat every insect they come across. In fact, many species of insects that you may find in your yard could prove fatal if eaten by your chameleon. A basic rule of thumb is that if you aren’t sure if the insect could be toxic for your chameleon, do not feed it to her. Caterpillars are especially dangerous. Caterpillars are the larval stage of butterflies. They are vulnerable in this stage. Most species make up for this by being poisonous or having urticating hairs (fuzzy caterpillars, for instance). These are extremely dangerous to your chameleon. Though garden-caught caterpillars are almost never acceptable feed for your chameleon, there are some species who are bred as food and are acceptable. Silkworms, for example, are not actually worms. They are caterpillars, and they are perfectly healthy for your chameleon to eat. Wax worms, the caterpillar form of the wax moth, typically called “grubs” at this stage, are also safe for your chameleon. They have low nutritional value and can be addicting for your chameleon though, so they should be restricted for use as treats or for training your chameleon to hand-feed. 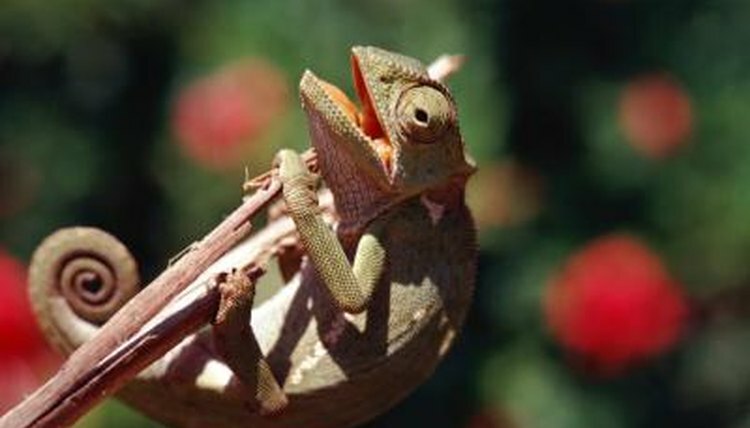 A healthy adult chameleon should eat five to 15 medium to large insects each day. The insects that you feed your chameleon should be “gut-loaded” before being fed to your chameleon. This means feeding the insects healthy plants for at least 24 hours before feeding the insects to your chameleon. Most feeder insects directly out of pet stores are underfed or fed on non-nutritional material. These plants can include carrots, collard or mustard greens, orange peels, melon or crushed up tropical fish flakes, dry iguana diet or alfalfa pellets. The insects should be dusted with calcium and nutritional supplement as directed on the supplement bottle. You also should offer your chameleon vegetation itself, such as carrots and dandelions to supplement the insect diet. Davison, Linda J. "Chameleons: Their Care and Breeding." 1997.